Yucay is a pretty valley at 78 km to the northeast of the city of Cusco, a very picturesque village with some fine Inca masonry in one of the squares. This area is important for the palace of the Inca Sairy Tupac 11, a construction made of stone and adobe mud brick with haute- and bas-relief decorations. It was a center of agricultural production for the Incas because of its mild climate, fertile land, abundant water and vegetation, especially fruit trees. According to the legends, in the middle of the XV century, approximately, the Inca Huayna Cápac got captivated by the incomparable magnificence of Yucay's settings and decided to settle there. 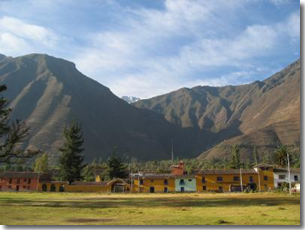 Two physical elements turned Yucay into the favorite place of the Incas: the softness of its weather and the magnificence of its landscape. Amazed by the richness and fertility of the region, he ordered the mitimaes to bring there the richest soil from all the Tahuantinsuyo valleys in order to increase the productivity of this place. The extraordinary cultivation terraces of Yucay constitute a testimony of this enormous effort.